This story was updated at 1:10 p.m. ET. HOUSTON – Two spacewalking astronauts upgraded the International Space Station with new power cables and other gear Wednesday (May 24) despite some discomfort when one spaceflyer got something in his eye and the other got stuck in a tether. It was Feustel who radioed Mission Control about six hours into the spacewalk to say he had something in his right eye and that it was "stinging like crazy" and watering up, causing some serious discomfort inside his spacesuit. "Ok, feeling better," Feustel told Chamitoff and flight controllers in Houston. "My eye feels much, much better." As Feustel was returning some tools inside the airlock and retrieving the infrared camera, he likely got some anti-fog solution in his eye, lead spacewalk officer Allison Bolinger said in a news briefing today (May 25), following the spacewalk. Astronauts typically apply the solution to the helmets as part of their spacewalk preparation to prevent their visors from fogging up. "We've seen this happen a couple times in past," Bolinger said. "We gave him as much time as he needed for him to say he was good to go." Feustel's eye issues came after Fincke got tangled in a safety tether securing him to the space station's exterior. The tether snagged around Fincke's leg while he was routing power cables along the station's Russian segment. Ultimately, he had to call Feustel for help to get free. "It's great to be back outside. It's the most beautiful planet in the universe," Fincke said after he floated outside the space station. "Nice view, isn't it?" Feustel said. The spacewalkers immediately went to work on the exterior of the Russian Zarya control module to attach a power and data grapple fixture that will allow the space station's robotic arm to reach the Russian segment. By using the grapple fixture as a base, the arm will be able to "walk" across the module and extend its reach for future spacewalks or robotic maneuvers. As they work outside, shuttle commander Mark Kelly and mission specialist Greg Chamitoff supported the spacewalking activities, with Chamitoff directing the choreography and coordinating communications from flight controllers at NASA's Johnson Space Center in Houston. Amidst the flurry of activity, the crewmates kept things lighthearted as they worked. "No more speaking English on the Russian segment, guys," Chamitoff joked. Fincke did, however, take the time to say a few words in Russian as he and Feustel worked outside the Zarya module. "I want to say a quick hello to our Russian friends," Fincke said before switching to Russian. "I'm not wearing a Russian EVA suit but I can guarantee you that we will do the work on your behalf with much enthusiasm, and Drew says hello." After the grapple fixture was attached, the spacewalkers made quick work of installing a video signal converter cable nearby. Feustel and Fincke then worked to re-route a series of cables to beef up power to the Russian segment of the space station. The new cables, which stretch between the Zarya control module and the U.S.'s Unity node, will provide backup power between the two modules and will give the area added electrical redundancy. Endeavour shuttle astronaut Mike Fincke (left) stretches his arms while wearing a spacesuit during a spacewalk exercise test on May 25, 2011 before the third spacewalk of NASA's STS-134 mission to the International Space Station. The new excercises help remove nitrogen from spacewalkers' bodies to avoid developing the bends. Feustel and Fincke also finished up some work that was left over from an earlier spacewalk. 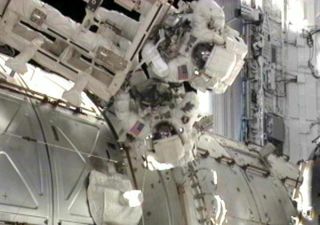 The spacewalkers installed a cable for an external wireless system on the outside of the U.S.'s Destiny laboratory. The mission's first spacewalk was cut short due because of a glitch with the carbon dioxide sensor on Chamitoff's suit, forcing flight controllers to move the cable installation to today's outing instead. The final tasks of the outing included photography of the thrusters on the Zarya module and infrared photography of an experiment located on the exterior of the space station. Prior to today's spacewalk, Feustel and Fincke also tested a new exercise protocol to help them adapt to the spacewalking environment, and to help them combat decompression sickness, which is more commonly known as "the bends." The In-Suit Light Exercise (ISLE) protocol helped to increase their metabolic rate to more quickly purge nitrogen from their bloodstreams before the start of the spacewalk. The method involved some callisthenic exercises, such as lifting arms and legs, for a time while inside the pressurized spacesuits. The ISLE protocol was used instead of the traditional overnight campout in the Quest airlock that precedes spacewalks. Based on the spacewalkers' medical checks following the outing, and feedback from the astronauts themselves, NASA officials reported that the ISLE method appeared to be very successful. "[The flight surgeon] gave the crew a clean bill of health and the crew had nothing but positive feedback about the protocol," said lead space station flight director Derek Hassman. "They really love the simplicity of the protocol. Medically, procedurally, and quality of life for the crew, ISLE was a complete success." Today's outing was the 158th spacewalk to build and maintain the space station. It was Feustel's sixth spacewalk, and he has now spent 42 hours and 18 minutes working in the vacuum of space, placing him 14th on the all-time records list. Today's excursion was Feustel's final spacewalk for Endeavour's STS-134 mission. Today's spacewalk was the eighth of Fincke's career, and it brought his spacewalking hours to a total of 41 hours and 13 minutes. Fincke is now tied for 18th place with Russian cosmonaut Talgat Musabayev on the list of spacewalking records. Fincke and Chamitoff will conduct the mission's fourth and final spacewalk on Friday (May 27), which will also be the final spacewalk conducted by a space shuttle crew.